There are a number of new home projects that opened around Southern California in 2015 that highlight the latest and greatest in product design, marketing techniques and extra features. In fact, some may even say these projects “brought the wow”. Meyers Research spends all year analyzing trends and focusing on what makes the housing market tick. To take a break from this often very focused work and spread some holiday cheer, we sent our Vice President of Advisory Adam McAbee out to scour the market to find great examples of “next generation” product. The video above highlights what he found at 10 such projects, which ranged from high-density detached product priced in the $600,000s (relatively affordable for this area) to large estate-sized homes priced in the $2 to $3 million range (before options/upgrades, premiums and landscaping) to resort-oriented townhomes priced over $3 million. Wine Rooms – they’re baaaack. Wine rooms were popular during the peak a decade ago, but they fell by the wayside during the downturn. They are now prevalent features of the main living/dining areas in many upscale projects. Spa Bathrooms – who needs to spend the day at the spa, when you can luxuriate in your own bathroom? Showers are quickly becoming the size of large closets, and bathroom “suites” can even include an outdoor “sleeping porch” – see the Donatello floorplan at CalAtlantic’s Estates at Del Sur in San Diego. Huge Kitchen Islands – not to be confused with elevated dance floors, kitchen islands have become enormous, providing not only plenty of cooking space, but practically enough seating area for a Thanksgiving dinner. Countless Living Rooms – want to have a seat in the living room? Sure! Which one? We found examples of informal living rooms opening up to outdoor patio living rooms that connect to backyard living rooms, providing enough seating to seemingly host a U.N. delegation. Super Laundry Rooms – tired of filling your washing machine with countless loads of laundry in a never-ending cycle (pun intended)? Instead, opt for a “super laundry room” that includes two washers, two dryers, a large refrigerator, lots of counter and cabinet space and even a television. Multi-Generational “Apartments” – gone are the days of the “granny flat”. Instead, see the optional second-floor guest space in Residence 1 of The New Home Company’s Oliva project in San Juan Capistrano. It includes a full kitchen, separate living room, an outdoor deck and a large bathroom. Pool Cabanas – why run through the house soaking wet when you can stop by your own private pool cabana, which can vary to include a living room and barbeque area (see Toll Brother’s Marbella at Hidden Canyon project in Irvine), a game room or a full bedroom with bathroom and living area. Roof Decks – density does not have to come at the cost of outdoor space. Trellis by Warmington in the Rancho Mission Viejo master plan offers optional roof decks on their Plan 3, providing added outdoor living space on otherwise smaller single family lots. Private Elevators – how do you offer multi-story product to a buyer that is older and may not appreciate stairs? Offer private elevators within the units, such as the Grand Monarch by William Lyon in Dana Point. Dog Rooms – Fido is as much part of the family as you are, just ask the estimated 50 million dog-owning households in the United States. Those that agree may find a dedicated “doggy shower” and built-in pet bed an attractive option. Light, Light and More Light – the use of natural light is a trend that most builders strive for. 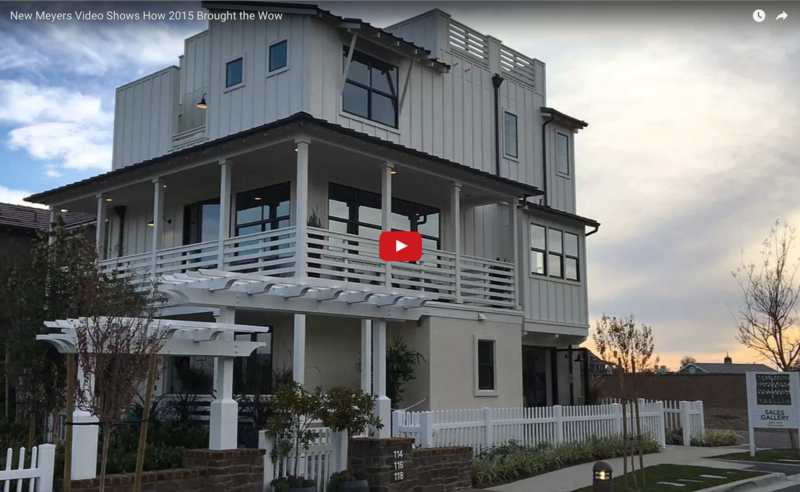 Several in the video above are successful by blanketing walls with windows, including collapsible walls – even along the front of the house (see the Cavalli and Salvatori floorplans at Kingston by Cal Atlantic in San Diego). Collectively, all of these themes and ideas can be implemented in a single project – particularly one that is priced above $3 million. Several of the elements, such as the use of natural light and large kitchen islands, can be used in nearly any market at a variety of price points. As we look forward to 2016 and beyond, we are excited to learn what the coming year will teach us in terms of new home product. Give us a call to discuss how you can use all of these features as inspiration to add wow to your new home community.